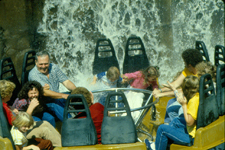 The biggest attraction added in Six Flags Great Adventure's history to date came in the eighth season with the addition of Roaring Rapids, one of the very first river rapids rides in the world. 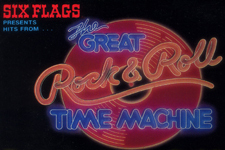 The ride was developed by INTAMIN in cooperation with Six Flags, and it was an immediate success at the first park to receive it, AstroWorld, so Six Flags added new versions of the ride as quickly as possible to their other parks. The public loved the exciting new ride and lines stretched for hours on hot days. 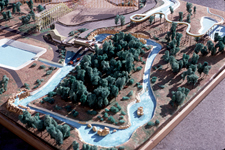 The new ride required a large plot of land, and the Six Flags Great Adventure Railroad was removed to make room for it. 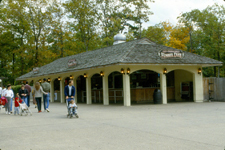 To reach the new ride, a long new pathway was built that included new shops and food stands. The new area further extended the boundaries of the park creating more space for the larger crowds coming each year. 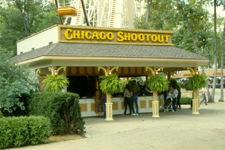 Each season new attractions came to the park in many shapes and forms. Each year new games were introduced, offering new challenges and even new game locations. 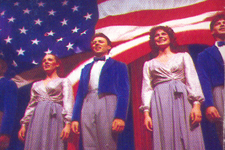 New shows were always being added, and the Americana Music Hall doubled the number of shows as live productions and the multi-media Great Rock & Roll Time Machine alternated on a jam-packed show schedule. 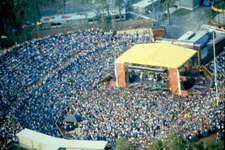 The summer crowds in 1981 were bigger than ever, with the park setting single day attendance records that have never been surpassed in the years since. 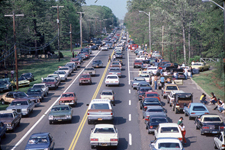 The concerts the park hosted in the summer of 1981 brought huge numbers of people to the park, causing traffic jams on Route 537, backing up onto Interstate I-195 and all the way back to the New Jersey Turnpike. FORT SHOP - SIGN MAKER- 1976 FORT SHOP - OLD WEST CANDLE CO.